Decorative: Antiqued vintage colors create unlimited options so you can generate a personalized experience for your farm house table. Plaid is always a timeless pattern that will never go out of style, and lends itself to being a versatile accessory. Functional: Add a pop of color to your kitchen, dining room décor or your farm house coffee bar with these simply lovely plaid placemats. Material: 100% COTTON: Set of 4 placemats made with woven cotton fabric and a machine stitched folded hem. Size: Approximately 13 inches x 19 inches. Iron: Place mats and towels may be ironed with low heat cotton setting if desired. 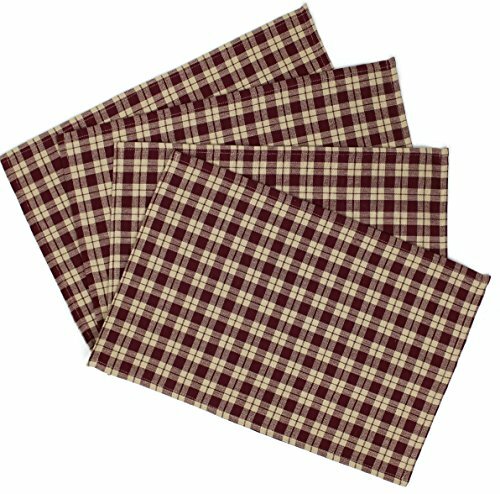 100% COTTON MATERIAL: Set of 4 place mats made with single layer woven fabric and a machine stitched folded hem. DECORATIVE AND FUNCTIONAL: Antiqued vintage colors create unlimited options so you can generate a personalized experience for your farm house table. Plaid is always a timeless pattern that will never go out of style, and lends itself to being a versatile accessory. If you have any questions about this product by Rustic Covenant, contact us by completing and submitting the form below. If you are looking for a specif part number, please include it with your message.